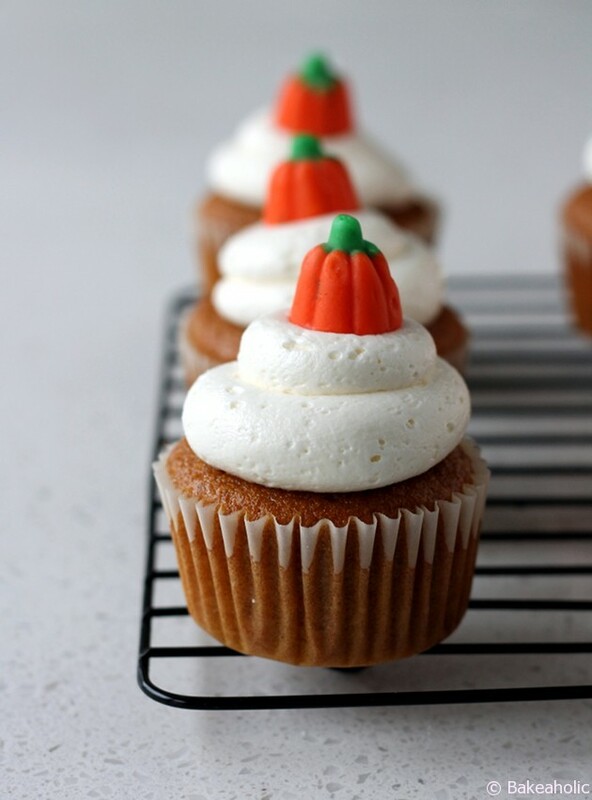 I have wanted to bake these cupcakes ever since I received Butter Baked Goods new cookbook – they were, after all, pumpkin. ‘Tis the season. hashtag everything pumpkin. I was saddened to see my two sugar pumpkins we bought at the pumpkin patch, were rotten. I’m not sure if it is because it was too early in the month, or that they were still partially in the plastic bag in our kitchen but they won’t be made into pumpkin pie anytime soon. Guess we’ll have to make another visit to the farm sometime soon. Luckily, I’m also fully stocked on pumpkin puree in case the mood strikes for a pumpkin inspired eat, be it sweet or savoury. I made these for the opening of our community club house last weekend – they were a hit. I think I’ll make them for our halloween parties coming up. Adam and I have two parties to attend, and one costume idea so far. I’m sort of over Halloween this year… I still love the holiday, and I’m excited to decorate the house and hand out candy but the whole dressing-up and partying thing has run its course I think. Are you going out for Halloween?? What are you dressing up as? We almost made it to Halloween without opening the candy – I bought it about a month ago, you know when school started and they already had Halloween loot out? Now, Christmas decor has already taken over the stores and Halloween items are on the 50% off shelf. Tonight Adam was craving something sweet and broke into his bag of CRUNCH bars. We almost made it – 9 days to go. Apparently they don’t taste as good as he remembers. Thankfully I don’t like them, so I am not tempted. However, if the Reese’s bag is opened I can’t be blamed for my actions. 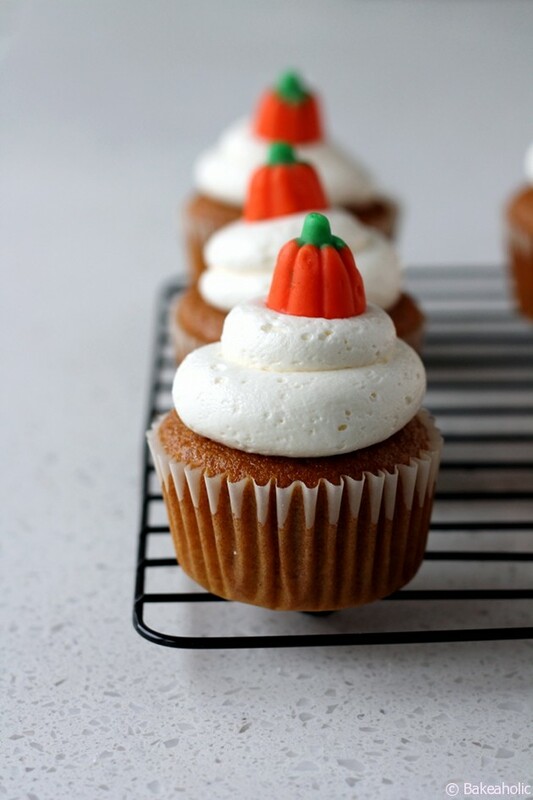 These cupcakes are delicious with a hint of spice and billowy soft cream cheese frosting. I made 30 regular sized cupcakes with plenty of frosting. Pre-heat the oven to 350 degrees F. Line a cupcake/muffin tray with liners. In a large bowl with a sieve placed on top sift together the flour, baking powder, pumpkin spices and baking soda. Set aside. In another bowl, add the oil and both sugars and whisk by hand until well combined. Add the eggs one at a time and whisk after each addition. The batter with get thick. Add the pumpkin and whisk again until well incorporated - the batter will begin to thin out again, and become silky smooth. Using an ice cream scoop or a 1/4 cup measuring cup fill each paper liner 3/4 full with batter. I made 30 cupcakes with this recipe, depending on the size of your muffin tin. 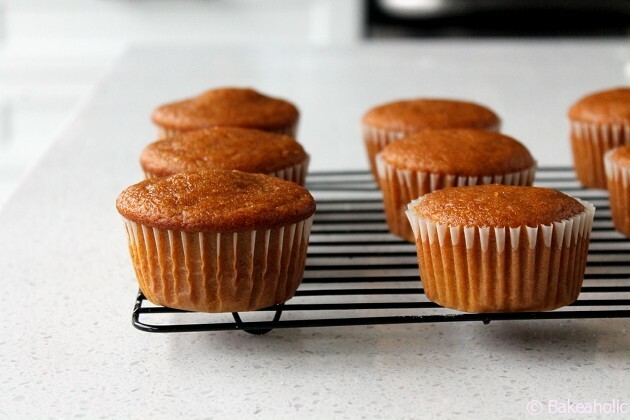 Bake in a pre-heated oven for 18 minutes, until toothpick inserted in comes out clean - the tops of the cupcakes should spring back when touched. Allow cupcakes to cook on wire rack. In a stand mixer fitted with a paddle attachment, beat the butter and cream cheese on high-speed until very pale in colour. Scrape down the sides of the bowl a few times while beating to make sure it is fully incorporated. Turn the mixer to slow and add the icing sugar slowly - mix well after each addition, turning the speed up and then back to low before adding in the next addition. Slowly add the vanilla and milk. Scrape down the sides once again. Turn the mixer to high and let it run for 10 minutes, stopping once or twice to scrape sides. The batter will become light, fluffy and silky. 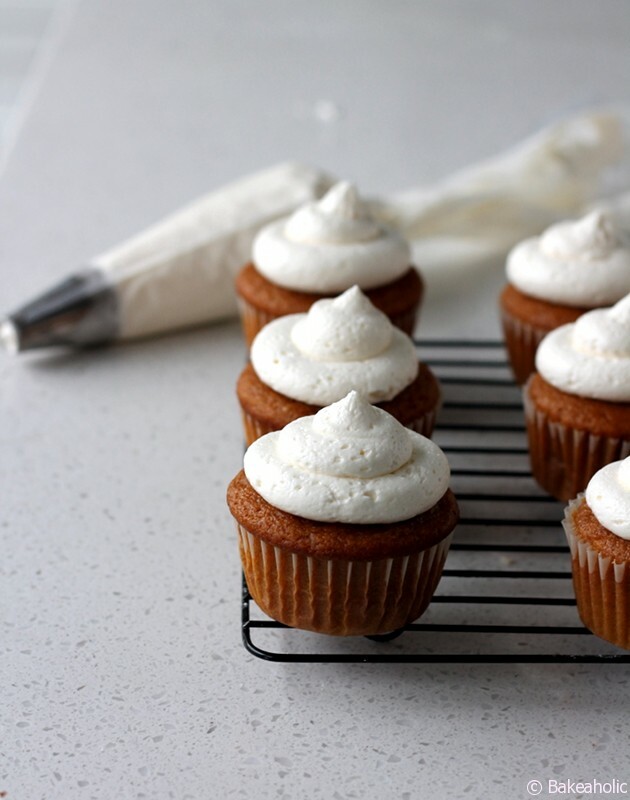 Transfer to piping bag, and pipe onto cooled cupcakes. Top with mini-pumpkin candy if desired. Store on countertop covered for 1-3 days. Store extra butter cream in fridge.